Looking for some interesting and fun accessories for your £25 Raspberry Pi computer? Maybe as a Christmas stocking filler for your kids? 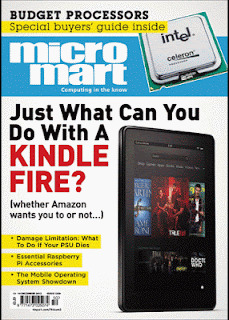 Then take a look at my four page Accessorise Your Raspberry Pi article in Micro Magazine issue 1239, out today. There's plenty of choice including mini keyboards and mice, tiny wi-fi adaptors, USB hubs, cameras, all kinds of GPIO-connected electronic boards, colourful cases and books. The latest version of the 'official' operating system - based on the Debian 'Wheezy' release - has all the necessary wireless drivers and support software. So, all you'll need is a suitable wi-fi dongle. 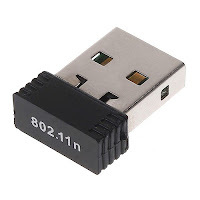 One of the most attractive is the tiny Nano Wireless USB adapter. Its miniature dimensions makes it a perfect companion to the Raspberry Pi. Yet, despite the size it's based on the more advanced 802.11N wireless standard, which delivers much greater range and speed potential than older 802.11g based alternatives. An easy way to start is with a breadboard-based project kit, which includes the ribbon cable plus various components and wires. An example is this programmable traffic light kit (goo.gl/kbZPB). With such a kit new projects can be tackled simply by purchasing a few more electronic components. Adafruits prototyping Pi Plate (goo.gl/DQhsw) goes a little further. The plate surrounds a breadboard grid layout with numerous connector blocks to wire up all kinds of sensors, components and electronic devices that won't easily fit on a breadboard. The Adafruit website also provide an informative tutorial about how to use the Pi Plate (goo.gl/WemiU).